This is one cool ring! Not being one to wear a ring regularly, I was anxious until I put it on. Feels great and looks even better! Get one! I''ve had a gold wedding ring for 34 years; just replaced it with this one as a gift from my wife. It''s absolutely beautiful! Very shiny, very comfortable, very impressive - I''m more than thoroughly satisfied! I purchased this ring for my boyfriend for his birthday (in April). The ring fit perfit. I is very comfortable for him to wear and it is a tough. We thought the ring would be marred with some paint but it came off with some cleaning of gas and some daily wearing the ring was clean in a couple of days. 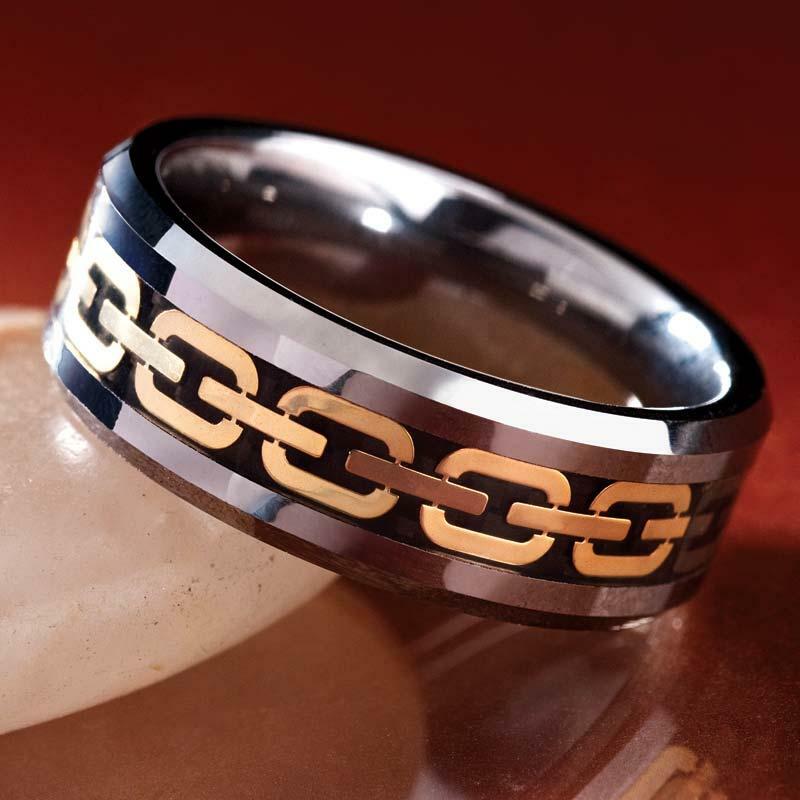 Now we are looking for weading rings and will be looking at tungsten rins from Stauer. Tough as nails, beautiful luster. I break almost everything. I abuse and do not care much for my things. I figure if it''s not tough enough, it''s not worth keeping. I retain very few items for any length of time, as everything I ever own usually ends up broken and tossed out. I have accidentally smashed the crud out of this ring a couple of times on steel and hard metal painted surfaces. In every case, the ring comes out shining like new. It''s heavy and very manly. I have only ever worn my one gold wedding band for 33 years. And, even that has needed to be replaced due to damage. As a gift from my wife, this ring has replaced my wedding ring. I see I''m not the first one here to make that statement. Consider that fact, as you decide if this ring is for you. I have never worn any other jewelry. However, the sheer beauty and toughness of this ring has made me decide otherwise. This will be the last ring I ever need to wear. The links symbolize, to us, the strength and unending nature of our love. The best $100 she ever spent! I saw this ring in a National Geographic magazine and loved it at first sight. When i got it it was just as sweet as the picture in the magazine. I show it off, and everyone who sees it can''t beleive the price I paid. Love it, it looks like it''s worth 10 time the amount I paid. As the person above, I discovered this ring in the National Geographic Magazine and was immediately impressed, with the price as well as its appearance. I am very satisfied and can''t believe the number of people who have noticed it and are intrigued by it. The ring replaces my original lost wedding ring. As did many others, My husband came across this ring in a National Geographic Magazine and it was Love at First Sight. We''ve been married 1 year and 4 months.. Our marriage was a kinda &quot;Spur of the moment&quot; thing, as were our pawn shop rings.. Lol... My ring has since then been replaced (of coarse) and his, he lost it (of coarse).. Anyway, just like our marriage, it has worked out beautifully, because he discovered the Men''s Tungsten Ring and I just ordered it.. I''m as excited about seeing his face he opens it as i am about seeing it on his finger everyday for the rest of my life!!!!!! My ring just arrived within 4 days of placing my order. This thing is SWEET! It is heavy, comfortable and makes quite a statement on my finger. My best bud is going to want to take it from me. I''ll show him where to get one for himself. I am very impressed and very pleased with it. I never wore a more comfortable ring, what a beauty. The number of people that compliment me on this ring has been amazing, and I could have sold it a dozen times if I wanted. It never stops shining, and it is dazzling when I buff it up. The best investment I ever made. Thank You! I have not worn a ring for years. I have always found them to seem to get in the way. This ring fits and feels great. I am very pleased with it and expect to wear it everywhere except work (where jewelry is not allowed for safety reasons).I am also very pleased with the service I received when I ordered the wrong size. The ring was quickly replaced at not shipping costs to me.A great product and great service - what more could I ask? I was flipping idly thru a magazine when I saw an advertisement for this ring. It immediately grabbed my attention. I loved the minimalist and sleek look of this ring and went right to my computer and ordered it on-line. When it arrived, I was thrilled. It looks better in person than in the ad. I''ve been wearing it daily for almost six months and it still looks to be in mint condition, as bright, shiny, and unscratched as the first day I got it. Unlike several other rings I''ve owned, it is still perfectly round, not flattening at all in response to being worn. It truly is a substantial ring, weighing in at 12 grams. That''s 20% heavier by comparison than a gold ring I have which is the same dimension and only weighs 10 grams. Now I see Stauer has released a matching companion bracelet which will be a nice compliment to the ring. best man'sand woman's too ! wow! purchased one four years ago: spouse liked so much, we ordered one for her. both have received numerous praise. I just recently lost my first ring, just replaced with same ! I've been wearing this ring for almost 3 years now and it still looks perfectly new. The tungsten is flawless and the inlay is gorgeous. I've had many many compliments on this ring. I've scratched it on cinder block and red bricks and it never leaves a mark, not even a tiny scratch. Very impressed with this ring, and also the service from this company. They were super helpful and patient. We love Stauer and looking forward to our next purchase. I loved my ring! wore it almost 7 years straight, unfortunately it broke in half today. I will definitely be ordering another one soon, have to replace the wedding ring. My wife and kids bought me this ring 2 years ago after losing my wedding ring, they gave it to me for Father’s Day. I can’t tell you how many compliments I get on this ring,I have to take it off al the time to show it to other people. I work outside in the elements cold,heat,rain, snow and this ring still looks as good as the day I received it! It has been in gas,grease, and all kind of chemicals! No matter where I am at when wearing it, it stands out! If you get this ring you will be completely satisfied I promise?? Thanks Stauer for selling such a Quality product! Crafted from the toughest stuff on planet Earth! I love precious metals. Honestly I do. But sometimes for a piece of men's jewelry, I crave something tougher, something less... precious. Once I found tungsten, I knew it was the only metal for me. This was a new kind of love. Not that sappy, romantic version with birds chirping and harps playing. I heard music, but it was the crunching guitar riffs and thundering drums of heavy metal. Any chirping birds were drowned out by the sounds of bullets, explosions and rockets. Okay, maybe I'm getting carried away. But that's what happens when you fall in love. You'll understand when you put on this Tungsten Ring. Where has this metal been all my life? Named for the old Swedish word for "heavy stone," tungsten is four times harder than titanium and 71% denser than lead. It's so tough that when they need to cut it and polish it they have to use diamonds...the hardest substance on Earth! It's the very same metal that goes into armor-piercing ammunition and the fuel nozzles of skyscraper-sized rockets. Can it handle a life of luxury? Of course. Even as a piece of jewelry it remains an overachiever. Unlike other fine metals, the spectacular polish and shine will never dull. And you're going to be amazed by how well this ring balances a heavyweight feel with "forget-you're-wearing-it" comfort. 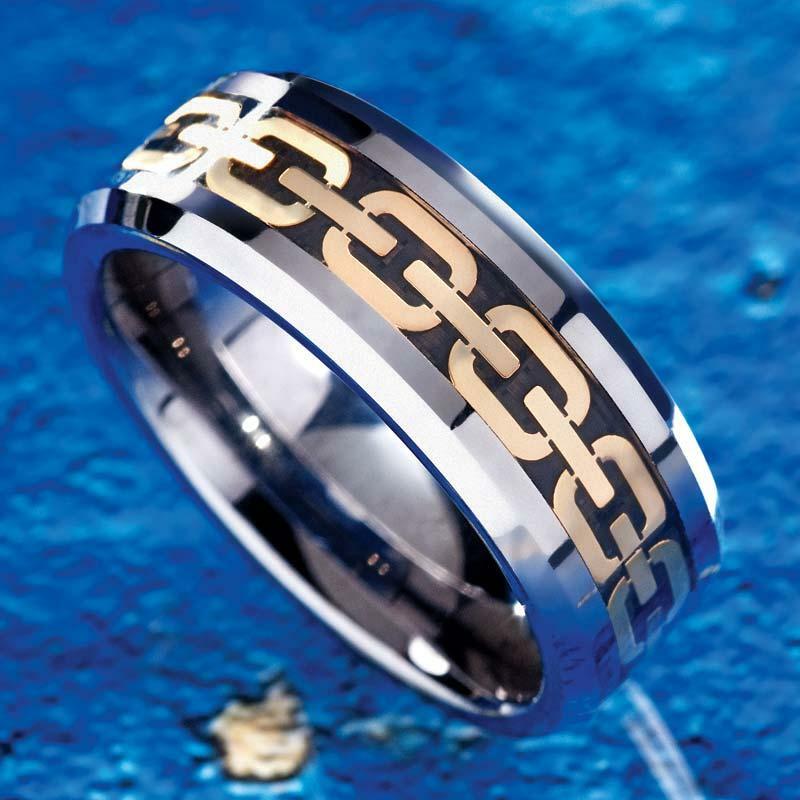 Added details include a handsome beveled-edge and a carbon-fiber and gold-tone chain link inlay. The perfect symbol of a relationship built to last.